One of my friends from residency contacted me last week for advice on converting from one EHR to another. She’s a medical oncologist. Her organization is bucking the single-vendor system trend by allowing its oncology practice to move onto a specialty-specific EHR. They’re planning to use a private HIE to tie it all together for patient care and data integrity. She wanted to know what kind of skills would be involved in supervising a data extract and migration since she had been asked to be the physician champion. I started explaining that there are multiple dependencies involved – from how willing the “old” vendor is to participate in an extraction, to what kind of data is moved, to how ready the “new” vendor is to handle a conversion or data insert. As we talked through demographic conversions, what to do with scanned documents, and various strategies to handle discrete data, it became apparent that no one had been discussing this process with the physicians at her organization. She told me a little about the vendor they had selected — how great the demos were and how much better they think it’s going to be than their single-vendor platform. We talked about her current workflows and how they might change in the new system. It sounded like they are heavily dependent on voice recognition technology at present, so I asked how the new vendor proposed to handle that. She wasn’t sure, so I asked if there were questions around that topic in the RFP. I was quite surprised to hear that they had just started working on it. I asked if she even knew what RFP meant and she didn’t. I told her it was a Request for Proposal and explained that the RFP isn’t just something you send to the vendor for response. Ideally, creation of the RFP involves a thoughtful review of your current state and your desired future state. It’s your way of letting a vendor know what your organization looks like as well as learning what their organization looks like. I explained that the fact that she has been tagged as the physician champion for this system yet she has no idea whether the system can handle their current preferred method of documentation is a big problem. I brought up other key features that she should be knowledgeable about that would be largely covered in the response to the RFP: MU certification status and track record, eRx capabilities and intermediaries, Direct messaging capability and provider, support, etc. Then I dug into how they should be requesting information on how the vendor plans to support the transition, etc. Since they’re coming off an existing EHR, those questions should have been included in the RFP rather than being posed to an old friend halfway across the country. We talked about the requirements analysis that should have been done before they even looked at other systems. Did they actually document how they thought their other system was failing them, or what they wanted to have different? Who was involved in the discussions? Do they know who the decision-makers really are? What is the budget? What will they do if they can’t take their legacy data with them into the new system? Will they keep their current practice management system or transition completely to a new platform? Do they need a vendor who is willing to interface? It never occurred to her that some EHR vendors will not interface with a third-party practice management system. I explained this is why the RFP process is important and not just to receive the vendor’s response, but to even know what business problems you’re trying to solve. We also talked about how proposals should be obtained from multiple vendors, not just the one you’ve pre-selected. In my organization (which has a strong and highly-regimented RFP process) we’ve had situations where one vendor’s answer to a question lead to additional questions for the other vendors as we hadn’t thought of a particular angle or process. We also talked about the fact that her organization is a highly visible non-profit that receives a lot of state and federal funding, meaning if they don’t have multiple vendors competing for the contract, that might be a serious problem. Realizing that if they neglected to complete a proper RFP process they were probably cutting corners elsewhere, I had some additional questions for her. Did you check the vendor’s financials? Do you think they’re at risk to be acquired or to have financial difficulties? Do they have a chief medical officer and what are his/her credentials? Who has input into product development? Did you do any reference calls with current clients? Did you do any site visits? As the call unfolded, she realized that being a physician champion (and thereby putting her stamp of the approval) was going to be a little more involved than she originally thought. I told her I’d send her some reading material and had my assistant drop my dog-eared copy of Jerome Carter’s EHR textbook in the mail. It’s not the current edition, but it will help her prepare for what’s ahead and figure out whether she even wants to be involved given the way her organization is operating. It never ceases to amaze me that organizations are willing to put themselves at risk by failing to follow basic business processes. Even in her single-specialty situation, there are millions of dollars at stake. Not only the purchase, implementation, conversion, and support fees, but the potential loss of revenue if they don’t get this right. 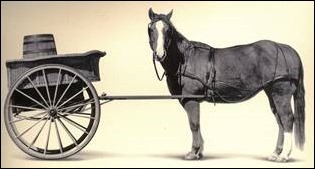 Does your organization put the cart before the horse? Email me. Dr Jayne …..the process of ‘pretending’ to do an RFP is unfortunately all too standard. The fact that organizations everyday fall for the marketing of a solution or service rather than really investigating is sad given the amount of money being spent. Not too mention the real time and effort that vendors put in to responding to them thoughtfully without knowing it is all a ruse until it’s all over. RFP’s are a great practice if done correctly. What I find in most cases is that they are heavily biased toward one vendor mainly due to a particular vendor being pre-selected. I can usually tell the way that the questions on an RFP are posed. I recently worked on an RFP response where there was no structure or understanding of one’s own business, applications and how critical they are to the business. It was as it the RFP was thrown together to just satisfy an internal requirement. The end result is that much time was wasted on the client and the vendor. There are significant soft costs to doing RFP’s for both parties. It’s critical that if an RFP is to be part of the buying process, that quality and unbiased work be put into it. OMG, the oncologist doesn’t know what an RFP is?? This is someone starting out from a very basic level. So she reached out to you and that’s good. However this oncologist has a lot to learn and one has to ask, where is their IT department? Where is the CMIO? They need to get up to speed to operate in a professional manner. The question about the vendor demo shows astounding naiveté. Of course the vendor demo looks good, it’s a marketing tool! The person running the demo (invariably a vendor employee and usually someone in Sales) knows exactly what works and what does not work. They stay away from trouble spots and steer towards system strengths. Also, they know how to “drive” the system and have internalized all the systems assumptions and workflow designs. On the (potential) customer side, here’s another thing to look for. Are the attendees actively watching? Are they asking questions? Do they challenge assumptions? Do they show any awareness of the EMR landscape and common problems and issues within it? An audience that is dead quiet, or spends all their time on smartphones, or arrives late and leaves early, or attends one demo when 3 different were scheduled, or takes no notes, these are all major signs of trouble during a demo. As long as the purchasing decision hangs in the balance you will find that everything is “easy” or “no problem” or “we’ll get right back to you on that.” Once you are committed then, well it’s not exactly a 180° turn, but the relationship with the vendor gets a whole lot more real. You rarely get an accurate picture from marketing. Talk to customer support, or development. Someone who has to deliver results and isn’t paid on commission. Of course everything is “no problem” who is looking to make their quota for the quarter and will never see you again, post sale! In fact, scratch that completely. Get an independent perspective. The KLAS surveys are pretty good. Also, try to find a peer who already has the product, or any product, and get their opinion, history, and the ins-and-outs. Think Marketing = Used Car Salesman. They aren’t all that way of course, but if you adopt this attitude it will protect you against numerous marketing sins. One item I would watch out for in an evaluation is a vendor’s references. Large vendors typically have a few individuals they have a particularly strong relationship with. I’ve seen systems that most of the nursing staff and the Doctor’s absolutely disdain get glowing recommendations by a select few who have a solid relationship with the vendor. I’ve even seen those individuals take calls for products that haven’t even been in production yet. Be very wary of vendor references and talk to individuals within that organization that aren’t as particularly close with that organization. It will paint potentially a very different picture.